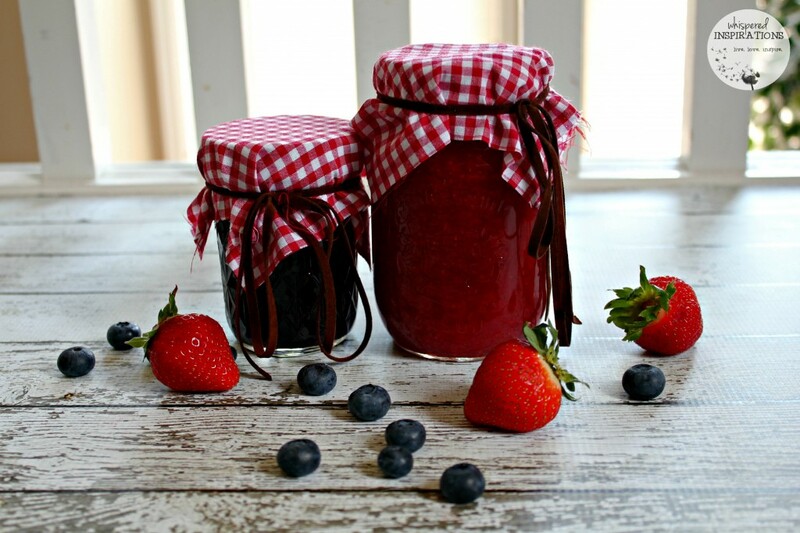 Organic Strawberry and Blueberry Jam Recipe! If you are like me, the thought of canning is something you’ve always wanted to do and while it sounds amazing, it can be a bit scary too. Especially if you’ve never canned like me. But, I learned that all of my fears and apprehensions about canning at home were completely unfounded. Why? 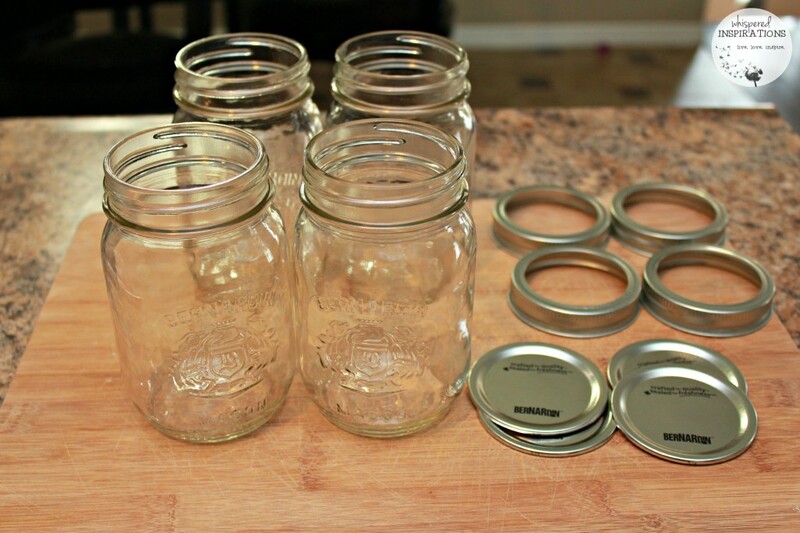 Simply because canning at home was unbelievably easy and I am definitely HOOKED. Home canning is not complicated. 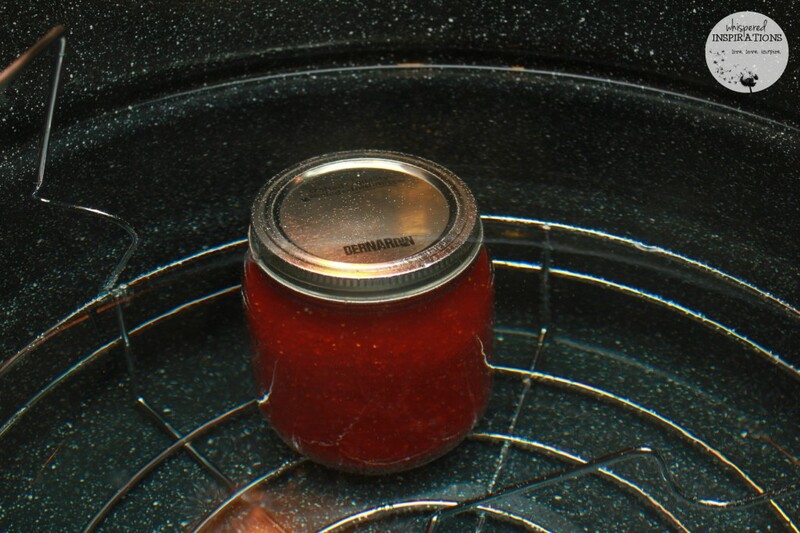 According to Bernardin, “it is a simple procedure that applies heat to food in a closed glass jar to interrupt the natural decaying that would otherwise take place. The air we breathe and all foods in their natural state contain microorganisms, such as molds, yeasts, bacteria, and enzymes. Food spoils when these factors are not controlled. Proper, safe home canning procedures control the growth of spoilage microorganisms allowing us to keep food beyond its normal storage period.” The process seems easy enough, right? For 100 years, home canning has been an exclusive focus for Bernardin Ltd. It’s no wonder Bernardin continues to be Canada’s trusted leader in home canning products. Home canning has always been the best way to preserve the natural goodness of our foods. Today home canning is even more attractive to Canadians because of their growing concern and interest in knowing the source of the food we eat. We see this thinking everyday in the healthy lifestyle concerns, organic produce, and the proliferation of farmers’ markets. We understand that home canning is no longer a survival necessity, but a way of showing individual flare and creativity. Our range of products and recipes will help you create spreads that remind you of yesteryear, or exciting new taste combinations. Summer is in full swing and along with it comes the delicious and plentiful fruit seasons. I am a huge fan of jams and spreads, my only qualms with it were that I couldn’t have it as often as I’d like because of the high sugar content. The sugar-free ones tasted different and contained aspartame. So, when Bernardin asked me to try my hand at some summer canning, well, I knew I had to give it a whirl and make my own organic jams sweetened with stevia. 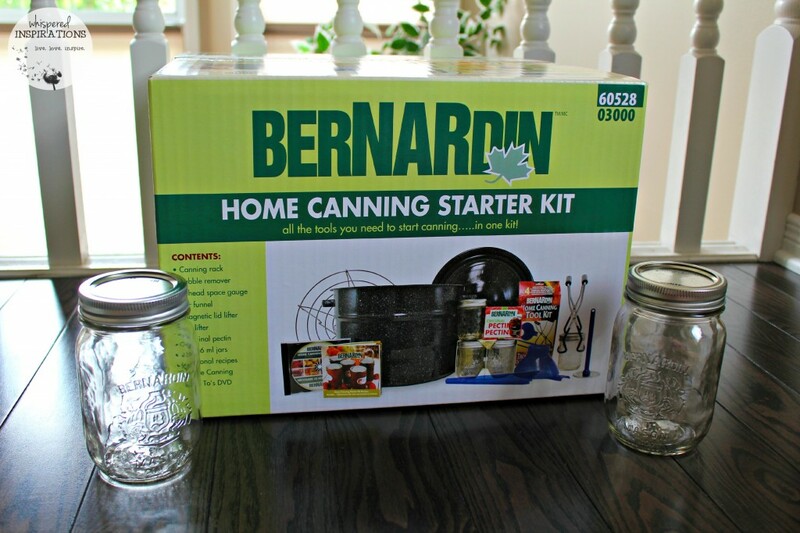 Bernardin sent over a Home Canning Starter Kit, perfect for lil ole me who has never canned before. It has everything you need to jump into the beautiful world of canning. It comes with an Instructional DVD, 21-quart canner, canning rack, jar lifter, funnel, lid lifter, bubble remover, decorative jam jars with lids, pectin and recipes. I also received an amazing Bernardin Cook Book with recipes and even decoration ideas. Jam in Just a Few Steps. It’s quite simple actually, you just wash your Bernardin cans with warm water and soap and then you place them inside the canner and let them boil. Place the lids into hot water (not boiling) and then move onto your fruit. What I love about living in the city, is the proximity to farmlands and a lot of small-town farmers. We had an abundance of organic strawberries and blueberries in the fridge and that meant one thing–let’s get to summer canning! Making the jam is super simple. 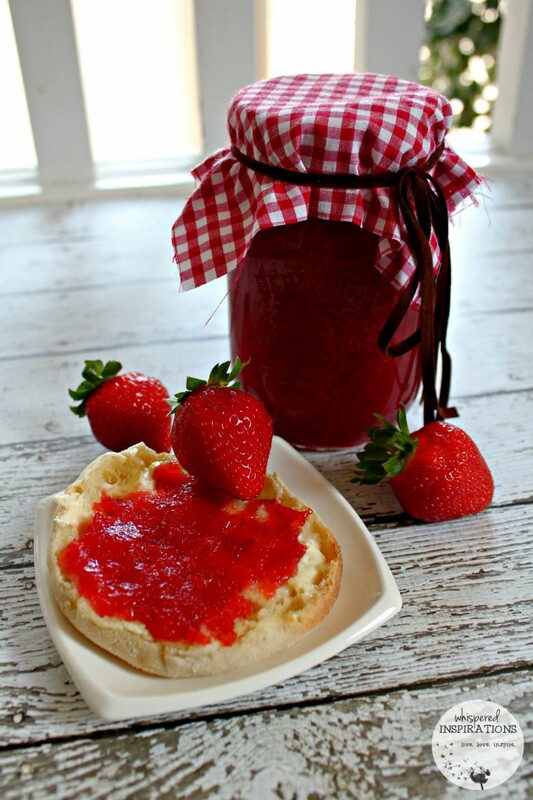 You can read below for the entire recipe for Classic Strawberry jam. 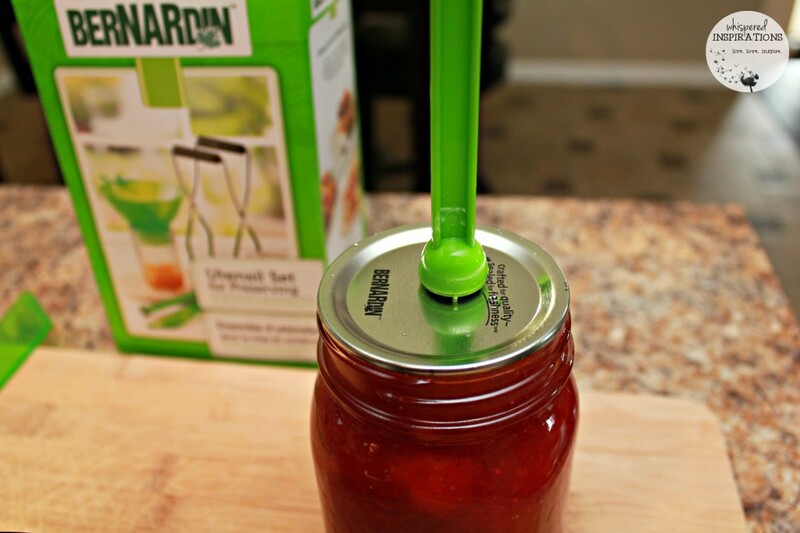 After you’ve prepared your jam, you can ladle it into the Bernardin cans using the funnel. Make sure that the jar is clean and free of any jam. For this recipe, we want to leave about 1/4 inch from the top of the jar. Adding the top of the lids is simple with the lid lifter and once you’ve applied the lids, you only tighten them hand tight. Don’t tighten it too much as it will make a false seal. With the jar lifter, you add the cans into the boiling water and cover. 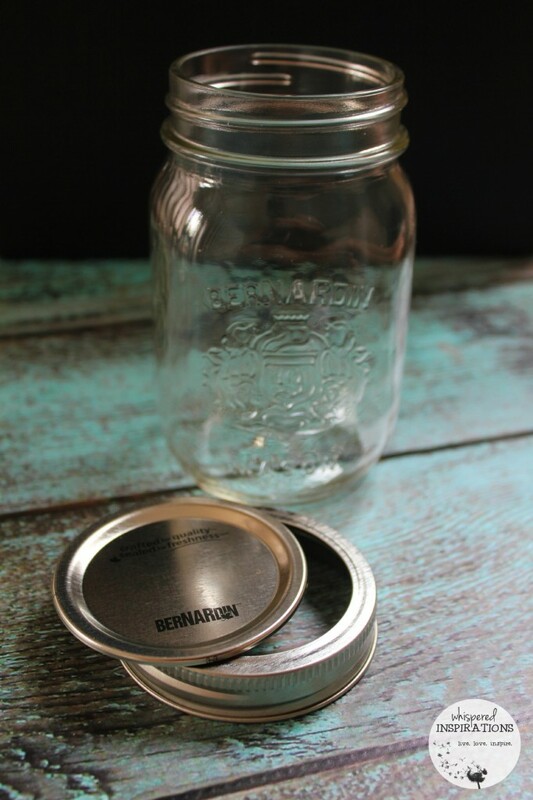 You can use the Bernardin Home Canning Tool Kit. 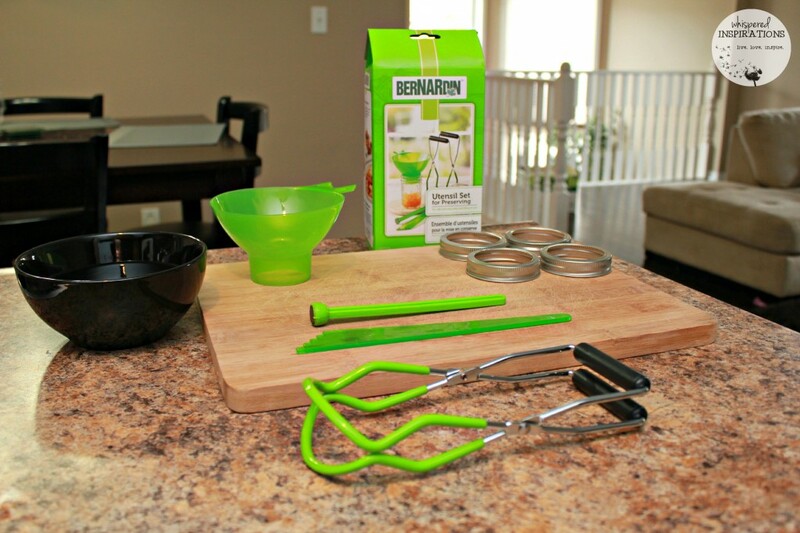 Yes folks, making jam is amazingly easy with Bernardin and even more so with the Bernardin Home Canning Starter Kit. It has everything you need and is perfect for beginners. I was able to make healthy jam that I feel happy serving my family. What was the verdict? It was a hit, the kids loved both but, loved the strawberry the best! You can also fancy them up and give them away as gifts! 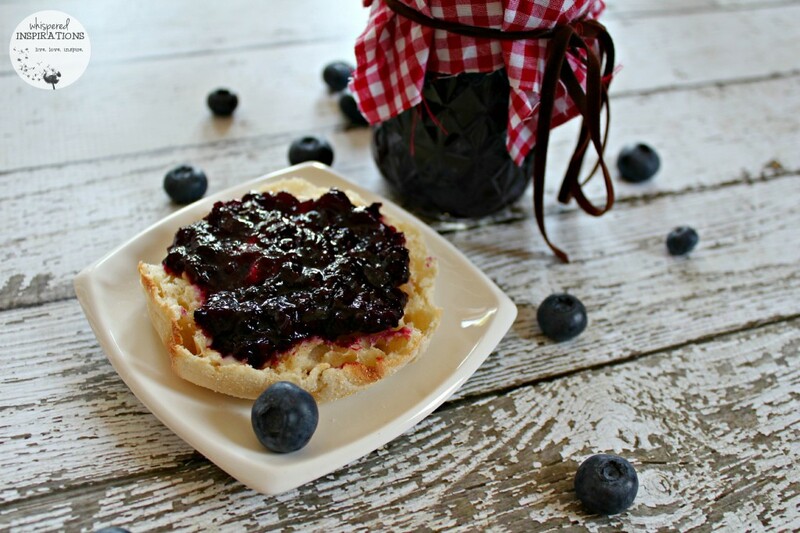 A delicious spreadable jam made with local and organic blueberries and sweetened with stevia. Made in Bernardin jars. Wash jars with warm water and soap. Place jars inside the BERNARDIN canner and boil. Fill with water to make them stay upwards. Wash and crush blueberries, one layer at a time. Measure your stevia and set aside. Measure your lemon juice, set aside. In saucepan, add the fruit mixture, lemon juice and BERNARDIN Pectin Crystals. Stir and bring to a rolling boil. Add 1/2 tsp of butter or margarine, this is to avoid foaming. Stir until fully melted. Add BERNARDIN Pectin Crystals and bring to a rolling boil. Remove from heat and with a spoon, remove any foam that has formed. 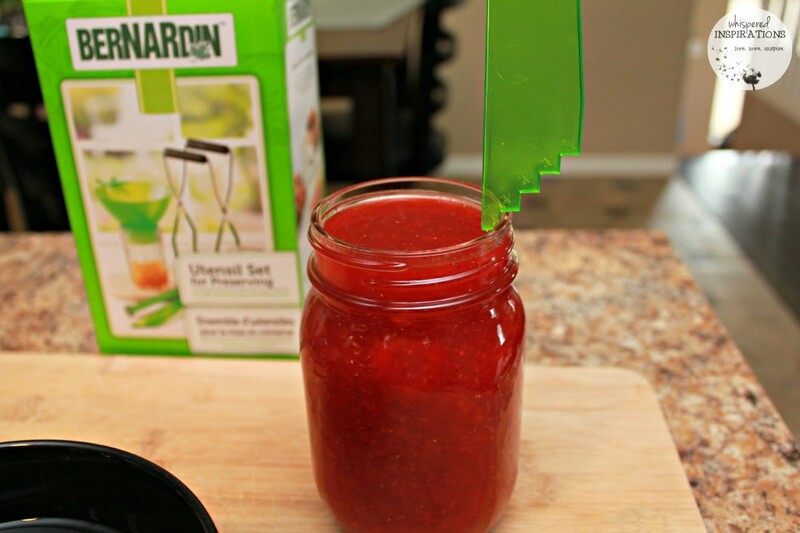 Get your BERNARDIN Home Canning Tool Kit and prepare to fill the jars. Use the jar lifter to remove jars from the boiling water, tip to remove all water and bring over to your station where you are working. Place funnel at the top of the jars, ladle in mixture until almost the entire jar is filled. Use bubble remover and measure the space to 1/4 inch headspace between the top of the jar. Make sure to wipe any mixture from the top of the jar. Use the lid lifter and center the lid onto the can. Screw the band only until it is finger tight, any more and it will create a false seal. Repeat for the rest of the jars and using jar lifter, return them into the canner. Once all jars are inside the canner, make sure that the jars are covered by at least one inch of water. Cover canner with lid and then bring to a rolling boil. Approximately 10 minutes or so. Once you've boiled, remove lid, shut off stove and let them sit for 5 minutes. Remove jars using the jar lifter, place them on a protected surface and leave undisturbed for 24 hours. Do not tilt or tighten the seal. Check the seal, you can do this by pressing down. You will see if the seal has taken. You can label and store jars in a dark and cool place. Or you can decorate to give away as gifts. Apply squares and wrap around top of the lid, use string or rope to tie it in place. Once the jam is open, it's optional for you to refrigerate. You can make the strawberry jam with the same recipe, just swap the blueberries for strawberries. Delicious with Peace of Mind. My jam was a big hit, it’s perfect for breakfast. We enjoyed them on English Muffins with some butter. Dara and the girls most enjoyed the strawberry as it was true to taste. They swore it was store-bought but, I was happy and I have to admit, a bit proud that I am now able to make my own jams that my family approves of. The jam was perfectly sweet and since I knew everything that went into it, I had peace of mind. Craving a Something Sweet and Tart? Well, this is the jam for you. 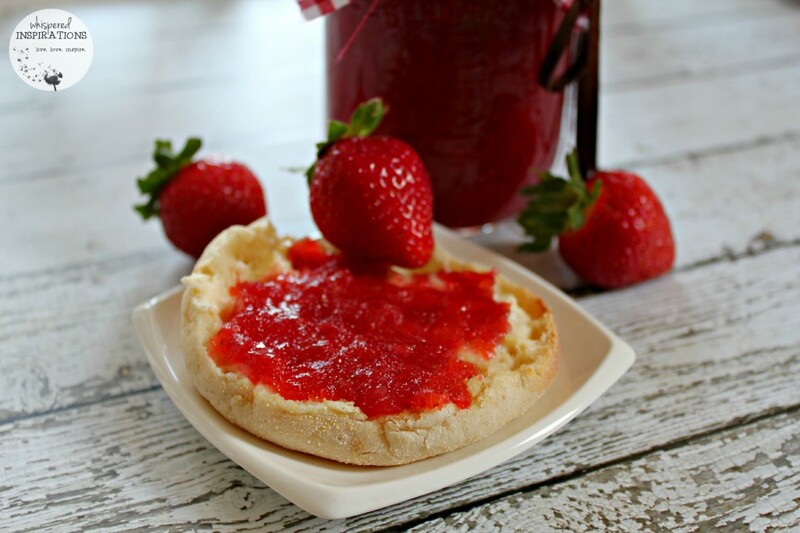 To make this jam, all you have to do is replace the strawberries in the recipe above. While I enjoyed the strawberry jam, I absolutely loved the blueberry. It was sweet, tart and absolutely delicious. My Dad came over to help us with a little home DIY and I offered him a cup of coffee with an English Muffin. For kicks, I used both jams to see which one he would like. He was just like me, he loved the strawberry but, loved the blueberry more! I am proud of my first venture into home canning. It was a fun learning experience that I was happy to convert into gifts for my loved ones too. The Bernardin Home Canning Kit and jars made the whole experience incredibly easy. I can’t wait to expand my home canning repertoire to garlic spreads, salsas and much more. Being so simple and oh-so-sanitary, I just have to! Now, it’s your turn, if you’re a pro or a beginner–get started! Right now, raspberries are in season and if you still have strawberries and blueberries stored, why not preserve it? If you are looking for a delicous homemade apple cider, you can make that too. For more information, you can check out Bernardin.ca and get started! Have you ever made your own jam–how did it turn out? My parents used to make homemade jam all the time, but they stopped for some reason. I miss it because it really was the best jam ever. That looks so delicious! I really want to try canning someday. I've make pickles but have never make preserves. This looks amazing! I totally want to make pickles. My kids would love me more! This sounds delicious! I love that it's TOTALLY healthy, because it's sweetened with a natural sugar alternative. I don't have to worry about excess calories from sugar or toxic byproducts from artificial sweeteners! Exactly. I love that you know exactly what goes into your canned goods. What a great find! All the tools you need with the instructions so that you can learn to can your own fruits and vegetables. I definitely need this or I would be lost. Homemade Blueberry Jam would be so nice for breakfast. I used to help mom do canning when I was little, I think her process was a lot more complicated than this. I've always wanted to make my own, maybe I need to try!! It always seemed this way for me too. So hard. But, really it\’s really simple. There are different types of jams and jellies though. This is the easiest I find. I love this kit! I want to start canning to make Christmas gifts this year! My family loves home made jam. We had a neighbour who always kept us supplied with some but she just moved away. Fresh preserves are the absolute best. I haven't made any in a long time, but oh now I want to. Very cool! I have a similar kit from another brand! Loved making my canned goodies. My recent post How I Put the Spicy Shelf to Work in My Home + a Promo Code! It is what we use the most in the house, so it worked for us using it in the jams. I love home canning. I just canned a bunch of tomato sauce today. Your jam looks delicious. Great way to use your Bernardin starter kit! Thanks, I want to to do sauces next. 🙂 The kit was definitely helpful. I love this!! I wanted to can fruit this summer but didn't know where to begin, this kit is fantastic! The kit will have everything you need, including a DVD to help you get started. I was always scared about canning growing up; until I did my first batch of canning jam 5 years ago. And from that first batch; I was hooked! Now i do it every year! I LOVE canning! I am hooked, this is going to be a part of our lives from now on. We started canning a few years ago and decided that next year we would can jams! We will try this out! Let me know how it goes. Tons of fruit in season right now. I totally want to can my own JAM too! Looks awesome. Thanks so much, it is easy! Especially with the starter kit! I've never tried canning! You make me want to do it though! Thanks for inspiring me today! I have always been a little scared to can, I hear it’s hard. I just need to take a leap and try it! It seems hard but, isn\’t at all. My recent post Join the #ListerineDesign Twitter Party August 7 2014 at 1pm est! It is a bit intimidating but, once you got it, you got it. It is so simple. I love this! Jarring your own jam should be a practice we still do more often in America. Reminds me of the good times in the past. And you know what it is your jam too! Exactly. I always wanted to learn and thanks to Bernardin, I was able to finally add this to my repertoire. It\’s a great practice. This looks great! I so need to do this, we go through so much jelly in our home. Yummy! It would save you tons! Wow does that ever bring back a lot of memories! My mom had something like that, I recognize the black pot and I used to helper her. Even still, I have never canned myself, it just seemed like too much work like you said. However it looks like improvements to the kit have made it super easy and your jams look absolutely delicious! I may just have to think about trying it. I was afraid at first but, it really is super simple. 🙂 Give it a try! Yum, thanks for sharing the recipe. I really want to try canning this year. I love homemade jam so much. My pleasure, there is nothing like it! Thanks so much!! It was really simple! I have always wanted to make my own jam. I think I might have to get this kit! Yes, you have to! It is so easy and I enjoyed it tons! I LOVE homemade strawberry jam!! There isn't anything better! Especially on a slice of fresh homemade bread. OH my, I have to try my hand at making homemade bread now! I would love to start canning fruits and veggies. I may have to get a starter kit. Thanks for sharing. My pleasure, the starter kit makes everything so easy. Making preserves is on top of my "Must Learn" list. That looks delish and that canning set makes it all seem so much simpler! Marina, it is super simple. The set sure has everything you need! We just went blueberry picking and making jam is a great idea. Although I don't recommend using Stevia – it's not good for the body. Thanks for your insight. I prefer Stevia over artificial sweetener. It is my preference. I guess that is the good thing about canning, you can add whatever you want. 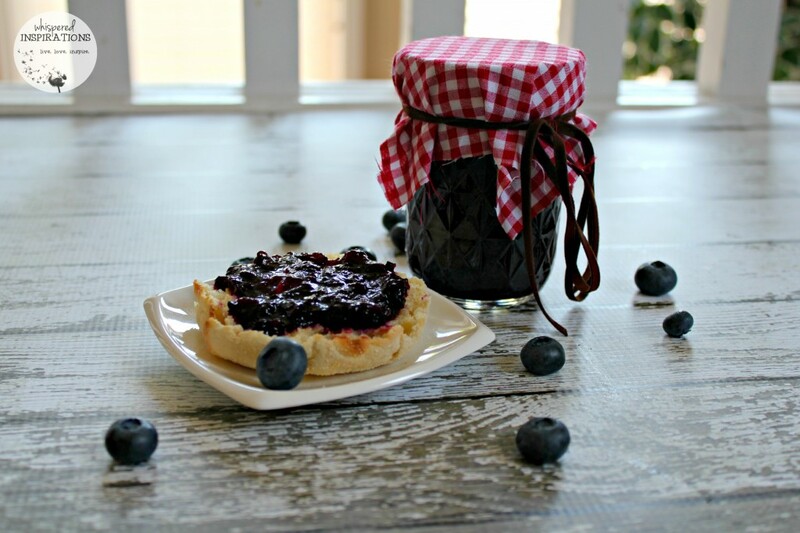 OMG your blueberry jam looks soooooo good, I would love to have some of that right now!! It is very tasty I must say! I've never used Stevia, definitely curious to use it! Most of our canning has been tomatoes. Every. Year. Strawberry and raspberry jam is definitely happening next season. Oh what a fabulous recipe thank you so much! I was hoping to get out and get some strawberries picked but didn't make it.. nothing better then home made strawberry jam! My grandmother used to make all kinds of jams, jellies and pickled goodies. I would love to follow in her footsteps and your post has definitely encouraged me to try! This looks delicious! I love canning sauces and jams. It is so easy and they are tasty! I have never made my own jam before! We aren't the hugest fan of jams, but I think they'd make a great gift. Thanks for sharing. I've always been curious about preserving, the starter kit is definitely something i would use, cheers! this looks good and has peaked my interest as it has stevia in it. I used to make homemade jam/jellies all the time but got away from it. It is really something I should get back into because homemade does taste better! Just got my last basket of wild blueberries. Just might have to try this jam, you make it look easy. Thanks for sharing. I love that you were able to make it with the Stevia. I'm diabetic and with a little bit of fruit I am fine it's the sugar in regular jams that do me in lol. So this will let me eat jam and not have to worry. This would definitely work for you! I love bottling and we do many cases of different things from jams to meats but this year I am going to use stevia instead of regular white sugar and cut down on the calories. Great instructions, even someone like me could do it! 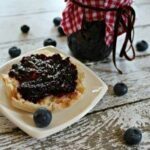 I am so excited to find this recipe using Stevia for homemade jam because my husband is a diabetic.This is awesome! Thank you for posting it.I love doing home canning too. I want to learn how to can. I have never done it. I should definitely get one of these starter kits. This jam sounds really yummy! I need to pull out my canning equipment this year and get my canning act together! These recipes are fabulous.I make this jam every year and love canning.Thanks so much for this post. The jam looks so fresh and delicious.I have some stevia here and I am going to try this.Thanks for the great post.